Way back in October I tagged along with Matty as he attended a conference up in San Francisco. Besides the fun of staying at the gorgeous Fairmont Hotel atop Nob Hill (and being tempted by Tiki drinks in their ridiculous-yet-kinda-awesome Tonga Room), I snuck away for an afternoon and headed over to Oakland to get a tour of a super-cool urban mushroom farm. 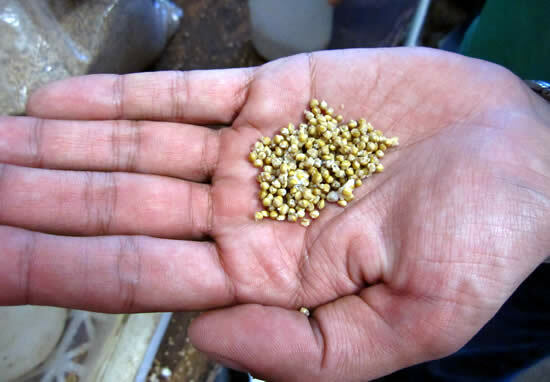 A true sustainability-in-practice company, the mission of Back To The Roots is to create unique, enjoyable, and sustainable products for their customers. 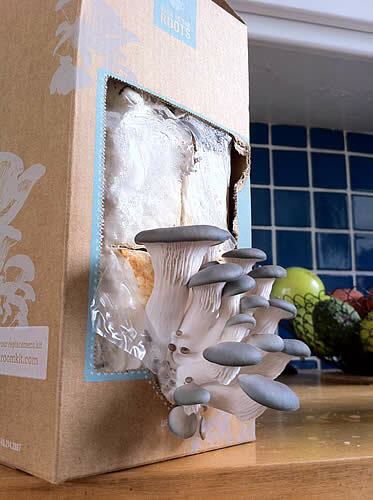 Their flagship product is their Do-It-Yourself Mushroom Kits (you may recognize them from my Holiday Gift Guide a few weeks back… I love these things!). 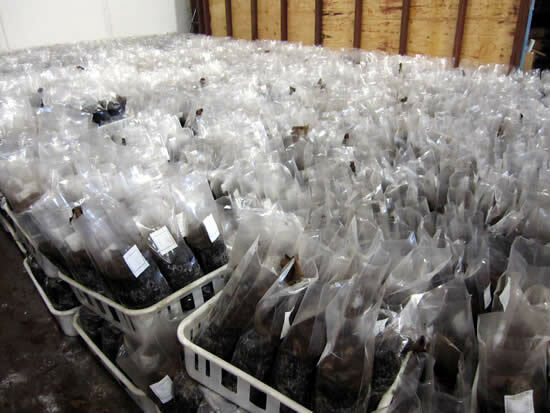 The kits are made of recycled coffee grounds that have been inoculated with pearl oyster mushroom spores. Once you receive your kit, you simply cut a few slits in the plastic bag, mist it with water a couple of times a day, and keep it in a cool spot indoors. About a week later, you’ll have some of the freshest, most wonderful mushrooms you’ve ever tasted. Sounds simple, right? Once it gets into your kitchen it is. 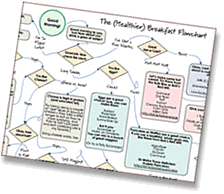 But behind-the-scenes, it’s a very specific and unique process to bring these kits to market — which took a lot of trial and error to get exactly right. Nikhil Arora, one of the company’s founders, gave me a personal tour, letting me in on all their secrets. The foundation of their product is recycled coffee grounds. Every morning they send their truck around to local Peet’s Coffee shops to collect the grounds. Back in October, they were collecting 20,000 pounds (!) of spent coffee grounds from sixteen Peet’s Coffee shops in the Oakland area every week. Nikhil just told me that they’ve since doubled that number, expanding to collect spent grounds from the San Francisco shops, too. That’s over 40,000 pounds of waste each week being being diverted from landfills! They’re on track to recyle over a million pounds of grounds by the end of this year. 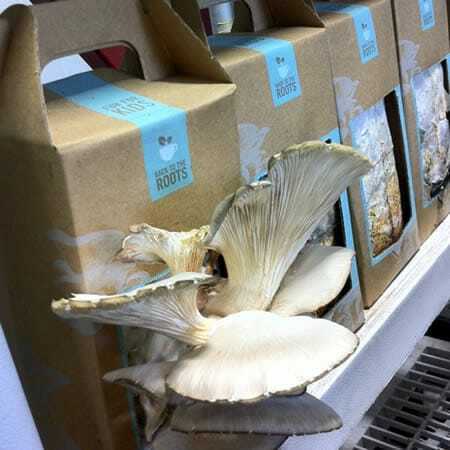 When they first arrive, the spent coffee grounds are too moist for the mushrooms to grow. They used to press the grounds by hand, and later in an old wine press — but quickly realized that wouldn’t last long. 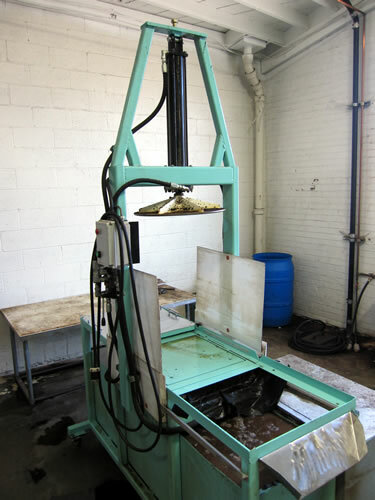 They now use a custom-fabricated hydraulic press, built by a local machinist. 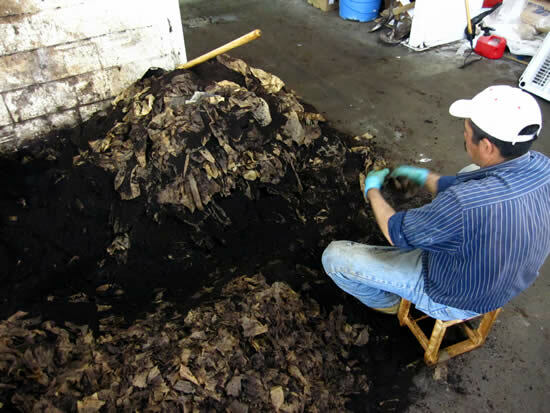 Once the grounds have been pressed to the right moisture content, the leftover paper coffee filters are separated, then broken down to be used in the soil as well. It’s a dirty job, but hey, at least it smells good. 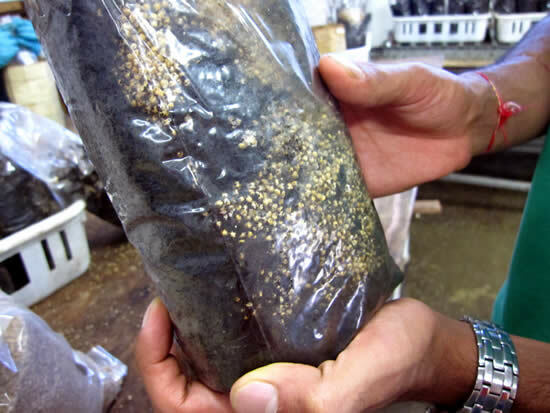 They purchase the Pearl Oyster Mushroom spores, which come on a “carrier” of rye grains. Next comes the inoculation: The spores are mixed into the coffee grounds and placed into the specially designed bags. The bags have a small filter at the top that allows them to breathe, just enough. Once the bags are sealed, they head on over to the other side of the warehouse for incubation. 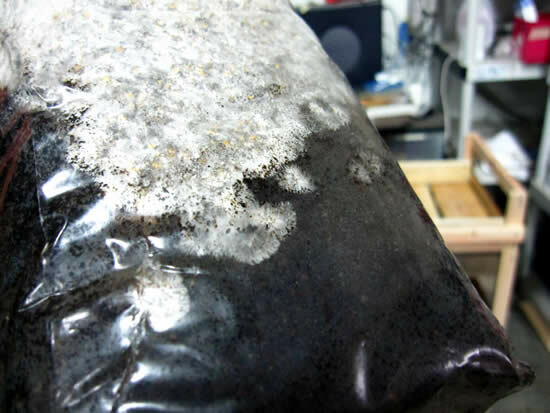 There, they sit for about three weeks as the mycelium grow and eventually colonize the entire bag — engulfing it in a hard, white crust. 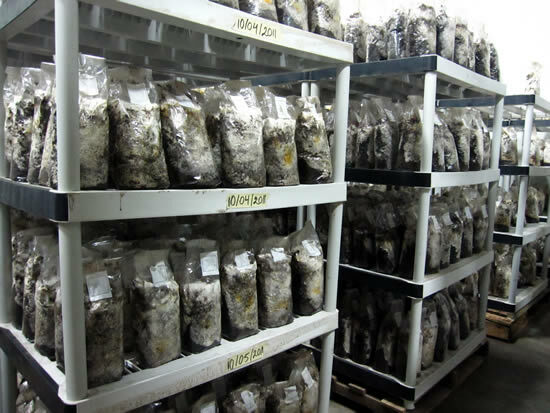 Racks and racks of fungus! In case you’re wondering, there’s no odor. Once they’re ready, the bags are simply slipped into the boxes, ready to ship out! The final product — tasty mushrooms! Huge thanks to Nikhil Arora and Back To The Roots for the tour! AAAHHH – so wish I’d seen the post before I finished shopping for my SIL!! This would’ve been the perfect gift!! So great to be able to meet the growers- growing mushrooms is such a fascinating process. I love reading about these mushrooms. I find it enlightening. Thank you for the post. I have seen these at WF and wondered if they really worked. I buy mushrooms every week so this would be too cool! !